and led by Local Guides from Jackson Hole! Book Your Scenic Wildlife Tour Today! Click Here. or Call or Text us at 307. 201. 4695 to book your tour! Please, leave a message if there is no answer. I am either out in the Mountains or Guiding a tour daily. ​Out in these Wild locations, there is often no cell phone reception. That's Wild Wyoming at its best! I will call you back later that day, when I arrive back in cell service. Jackson Hole, ​Grand Teton Park, and Yellowstone will start seeing their first newborns of the year soon. Wildlife, such as Elk and Moose, are migrating to their Summer range, making them easier to view out in the National Parks. Bison are on the move to, heading towards their summer range and are spread throughout Jackson Hole. Grizzly bears have emerged from their dens and we are looking for them to view every tour. 4/15/2019 We were with a big Boar Grizzly Bear for 90 minutes last night with terrific viewing throughout our time with him. Always a incredible experience, watching a Grizzly bear in the Wild! Book now for "Bear Season". The highest odds of seeing Grizzly Bears of the year! Spring time and early Summer is a Great time to take your Scenic Wildlife Adventure Tour and see several species of Wyoming Wildlife up close! Jackson Hole and it's surrounding expansive public lands featuring two historic National Parks, Grand Teton and Yellowstone, are the Last and Best of the Old Wild West! Maximize your time here in Jackson Hole by taking your scenic Wildlife Adventure Tour with Wild Wyoming Tours! 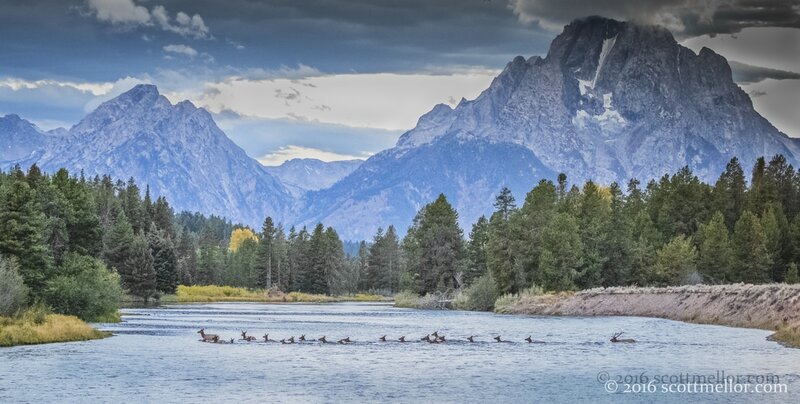 Get the most out of your visit to Jackson Hole, Grand Teton National Park and Yellowstone by taking one of our interpretive and scenic Wildlife tours early on in your visit to the valley, and gain the knowledge and foundation to efficiently use your vacation time to it's greatest potential. Experience the wide open ranges of these mountain valleys, with abundant wildlife foraging away, under the vast big sky of the American West. Soak in the incomparable views of the majestic Teton mountains, the Crown jewel of North America's Rocky mountains and discover your Vista of a lifetime! Book your Tour with us, and be guided in comfort & expertise throughout Jackson Hole, Grand Teton & Yellowstone by the top rated and highly recommended, Wild Wyoming Tours! Immerse yourself in Wild Wyoming and it's Wildlife, Book your Scenic Wildlife Tour today! A majestic Bull Elk swims his harem of Cow Elk across the Snake River in Grand Teton National Park during the rut. Their mating season is punctuated by Bull elk bugling challenges to other male Elk and securing as many Cow Elk as they can into their harems for about 6 to 8 weeks in the Fall. Pasture land on the valley floor of Jackson Hole below the Teton mountains and a dramatic sky. Tour Grand Teton National Park with a life long local and professional guide. Discover the Wild side of Grand Teton National Park and Jackson Hole. Half day Sunrise and Sunset tours and Full day tours available! Tour Yellowstone with a life long local and professional guide. Discover the Wild side of Yellowstone National Park and the Greater Yellowstone ecosystem. Oxbow bend in Grand Teton National Park with the first snow of the year on Mt. Moran and peak fall colors down below. Photography tours throughout Greater Yellowstone. Tour through Wild Wyoming with a life long local and professional photographer as your personal guide. Explore Jackson Hole, Grand Teton and Yellowstone and find the vantage point to capture that timeless image of Wild Wyoming your own!